Nasal Congestion in Babies – Causes & Remedies! Today I will be discussing about nasal congestion in babies. It’s really a difficult time when your baby suffers from it, since babies are obligatory nose breathers. There are several causes for nasal congestion. Extremely dry air and allergy are the two main causes. When this happens, the baby develops a stuffy nose. This makes breathing through the nose harder. So, they rely on breathing with their mouth. This in turn makes feeding harder for them. For the sucking action, the nose should be fully functional or else it really makes it difficult to feed the baby. One thing leads to another and the end result is a sleep deprived, cranky and hungry baby. It is really painful to watch your little one crying incessantly & overall disturbed. It’s really tough to watch your kid trying hard just to breathe. Babies don’t understand what’s happening with them, which makes them overwhelmed. The worst part?. They don’t even know how to sniff or blow their nose to clear the discomfort. There are ways to help in this case. The main one is using a humidifier. This is if the problem occurred due to dry air. The mist will help to moisten the inner lining of the baby’s nose that is extremely sensitive and tends to dry up when exposed to dry air. Another good tip, if you don’t have a humidifier, is to dunk a cotton cloth in hot water, squeeze out the water well, sit a slight distance away from the baby and then slightly wave that cloth in an up and down motion in the direction of the baby. This brings moisture to the immediate surrounding of the baby. The most effective tip was given to me by my son’s pediatrician. He suggested that I use Nasivion nasal drops. These help to decongest the nose and bring much needed relief to the baby. It comes in different strengths (0.025% & 0.05%) depending on the baby’s age. The doc prescribed him the 0.025% one. After using Nasivion, I immediately noticed that his breathing was not laboured like before. He became significantly calm and was able to feed well and thus sleep well. A happy baby results in happy parents 👪.. Check the Nasivion website for the dosage and always consult your paediatrician before using the product. Review : Glamego May 2018 Beauty box! Today am reviewing Glamego’s May box that was specially dedicated to Mother’s day that was celebrated on May 13th. This box is called the ‘Beauty Emergency Kit’ & contains 4 full size products and 1 deluxe sample. I have got to comment about this box though. Visually, I think this is Glamego’s cutest box yet. With pictures of baby animals printed on the whole box, it’s just adorable 😍. On the inside it says, “💛 U Mom” & a series of praising words that show the love of a mom for her child. There is a small card with the hashtag #DateWithMom, which gave the subscribers a chance to win a date with their mom in the best place in their city by posting a pic with their mom on social media and tagging Glamego in it. Then there is a leaflet that shows all the products in the box and their descriptions/prices. ● Votre Multi vitamin & Rejuvenating night creme – First time hearing about this brand. It’s an Ayurvedic, highly restorative night time moisturiser which is a blend of vitamins & antioxidants that moirurize and protect the skin. It’s thick and rich and has a luxurious texture. It has a very strong scent, almost like products meant for men. Other than the scent, I like this cream a lot. It’s very moisturising & hydrating. This is the deluxe sample that I mentioned earlier. However, it’s almost a full sized product itself. The one in the box contains 30 gms while it’s full sized one contains 50 gms. This 30 gms one itself is worth Rs 1550! ● Rohto Acnes Mentho-Cool pimple defence face wash – Acnes is Japan’s No.1 acne care brand. This product is a newbie in India. Since this is a specific product for acne, I didn’t try it out because I’ve normal/dry skin. But it’s definitely a boon for those who have acne, to find this in their box!. It’s 50 gms, comes in a tube & is worth Rs 99. ● Seer Secrets lip scrub – I am so absolutely in love with this one!. I could say it was love at first sight 💓. It’s packaging itself is in a cute little round container. I don’t think it can get any more organic than this. It’s all natural & vegan. It’s ingredients list is – Raw cane sugar, almond oil, cocoa butter, beeswax, liquorice extract, rambutan extract & date extract. It smells absolutely delicious. I actually felt like eating it up. Lol!. It does a great job of scrubbing the lips and revealing baby smooth lips. It’s slightly on the dry side though. I prefer lip scrubs to be slightly wet/viscous so that it’s easier to work with. But that said, I do love this product a lot.. This 8 gms tub costs Rs 261. ● Bella Voste Sheer creme Satin touch lust lipstick – Super long name for a lipstick!. I got the one in 10 Satin Pink. It’s a gorgeous, matte finish purplish pink. It’s a gorgeous color that suits Indian skin tone. I love it’s creamy and smooth formula. This is hands down the best lipstick I’ve used in my life. That’s saying a lot especially since I’ve used so many lipstick brands.. This one which has 4.2gms is worth Rs 225. ● Bella Voste nail polish – I got a pale/icy green kind of color. It’s in the color 13 Perfect Pick. This is a 9+ toxin free nail enamel that’s non yellowing and formulated in Luxembourg. This 9 ml bottle is worth Rs 249. Overall, I am beyond impressed with this Glamego box. Every product in it is so high quality and useful. This box contains products worth over Rs 2350 but costs only Rs 299!. So, definitely try it out. You can sign up here. Note : This box was sent to me for review purposes. All opinions are 100% my own & honest. Review : Mother Sparsh 98% Water Wipes! I had done a review of several Mother Sparsh products, a while back. You can read it here in this post, if you missed it. Among those products, one was their 98% water wipes. If you see that post, you’ll notice that these wipes were packed in a white and green pack. However, now they have changed their packaging to a sky blue one and I decided to review it. I have used several brands of baby wipes (including brands from abroad). However, nothing comes close to Mother Sparsh’s baby wipes. First of all, it contains 98% water. No other brand can beat that!. Then, these wipes are made from plant based fabric which is super soft and gentle on baby skin. It’s so moist too. Other baby wipes are loaded with chemicals. But these water wipes are as gentle and mild as it can ever be. I love it and moreover, it makes me happy that my little son is taken care of in the best way possible. These wipes should be the #1 choice of every parent. The wipes are slightly thinner than other brands but still it’s extremely moist and soft. I feel happy using it to clean my baby. The resealable packaging keeps other wipes moist too. These wipes are as good as pure water and cotton, thus highly recommended for even newborn baby’s delicate skin. It’s a non allergic product and is Ayurvedic too!. You guys definitely should try this out. Click the below image to purchase this product (will lead to Amazon’s Indian site). It costs only Rs 498 for a pack of 3. Each pack contains 80 wipes. Review : Glamego Apr 2018 Beauty Box! I fell in love with the April Glamego box even before opening it, because of the perfectly summery magnetised box the products came in, featuring a hot pink stick ice cream that’s started to melt. It captures the feel of the very hot & humid climate in India right now. • Tjori Anti Tan pack – With wild turmeric (Kasturi manjal) as the main ingredient, this perfect age old formula helps in removing tan. It’s a loose powder and I used it by mixing it with water to form a smooth paste. You could also mix it in some rose water. I left it on for 15 mins and washed it off. My skin felt glowing after using this. It has a really pungent/strong smell. Other ingredients in it are bentonite clay, fuller’s earth, natural white clay, essential oils etc. It came in a 50 gms container and is worth Rs 525. • My Island Kiss lip balm – This one’s packaging is simply gorgeous and it has an international level of quality to it. The tinted lip balm I got is in the color Bunny Pink. It’s not sticky and is easy to apply. It has SPF 15. It is non toxic, organic & petroleum free. Ingredients list – Tropical Kokum & Mango butter, organic beeswax, stevia, organic carrot seed oil, pure castor oil, Japanese Cherry blossom essential oil, organic Macadamia nut oil, vitamin e oil and natural organic color. It’s 100% pure!. It smells absolutely lovely and yummy 😍. The tube contains 14gms and is worth Rs 499. • Vedic Line Gold facial – This box contains 6 sachets of different products that’s to be used in a step by step process starting from cleanser and ending with a serum. It’s ingredients are all known for their brightening property. This one can be used even as a bridal face pack. I have high expectations of it. Since it’s best used prior to an event/occasion, am saving it for later. I will be doing a separate post for reviewing this and update the link here later. This at home facial kit is worth Rs 350. • Nelf USA compact – I was so in need of a compact and that’s when I received this!. What a surprise ☺. This one has SPF 18 in it. I wore it several times now and can say it roughly lasts 3 hours on my face especially since the hot climate makes me sweat bullets.. I love carrying this in my vanity for a quick touch up. This is worth Rs 350. • Natural Bath & Body Sea Clay face masque – This green colored clay mask is clarifying and I had doubts about using it, since I’ve normal/dry skin. However, for the purpose of this review, I tried it and was pleasantly surprised that it left my skin feeling and looking good. It didn’t dry out my skin at all. It has a lovely scent. There is a heating up sensation immediately after application. Nothing to worry about though!. I do recommend it for all skin types except those with sensitive skin. The full sized version of this is worth Rs 150. Overall, this box is definitely summery and Glamego really excelled in putting together this box. Totally, this box is worth over Rs 1800, but you pay only Rs 299 for this subscription. So, definitely try it out. You can sign up here. Review : Glamego Feb 2018 Beauty Box! With February’s box, Glamego has just reaffirmed the fact that they are indeed India’s No.1 beauty subscription box. Titled ‘Classy Flaunt’, this time the box contains 4 full sized products worth Rs 2000, while the box itself costs only Rs 299! ● Mcaffeine Choco face pack – This comes in 2 variants – gel based for dry skin and clay based for oily skin. I like that Glamego is truly a personalized box. I received the one for dry skin because they asked me my preference beforehand. Chocolate and caffeine, both are powerhouse ingredients that bring out the glow in your skin while pumping it with antioxidants. This mask looks just so yummy and smells delicious. God knows how I resisted just eating it up. Lol!. I applied this creamy mask for about 15 mins and washed off with cool water. It left my skin looking radiant and youthful. I love this brand, which is India’s first caffeinated personal care brand. This product is worth Rs 359 for a tub containing 25ml. ● Kronokare Pollu-Stop face – This colorless mist is one of a kind, I feel. It helps in warding off pollution from our face. How cool is that!. It’s perfect for those who spend a lot of time outside. It actually acts as an invisible shield against pollution nano particles and thus helps protect, nourish & soothe the skin. It has a strong scent which am not really a fan of. The product itself gives a barely there look when sprayed on the face. It can be used before or after applying a face cream. It comes fitted with a fine nozzle and as such spraying with it creates a nice mist. It specifically says ‘face’ in it’s name because this same product is available for the hair too that helps our tresses fight against pollution. It’s actually one of the products in Glamego’s March box. This product is free of sulfates, silicone, parabens, fragrance or mineral oil. It’s worth Rs 495 for a bottle that contains 30 ml. ● The Nature’s Co Radiance face cream – This is hands down my favorite product in this box. It’s main ingredient is saffron, something that’s very expensive and wonderful. It smells of saffron itself. Saffron helps in making the skin radiant and am so glad I got to try out this cream. The texture of it is so unlike regular face creams. It’s balm like, slightly viscous and yet when applied on skin, it slides on smoothly like a rich cream. A little goes a long way. [This pic is from my Instagram. Do follow me, if you aren’t already]. The tub is super tiny, containing only 25 ml. But, guess what?. It costs a cool Rs 550!. The ingredients list is as follows : Saffron, Aloe Vera extract, Grapeseed oil, Jojoba oil, Wheatgerm oil, Almond oil, cream base, aroma & natural preservatives. This brand is cruelty free & eco friendly. ● Bella Voste Perfect lip gloss – This was one of the products I received in the January box too (read that review here). But I selected a different shade this time. It’s a light, gorgeous pink shade called Pop of Pink. Overall, I love that the general theme of this box is to bring out the best in your skin. I am all about skincare as some of you already know. I highly recommend Glamego. You can sign up here. Review : Everyuth’s Three Latest Skincare Products! Everyuth is one of my favorite, budget friendly brands in India. Today I will be reviewing three of their latest products. ○ Golden glow peel off mask – Am not a fan of peel off masks. However, this one sure made me fall hard because the results were such. It says ’15 mins radiance’ on the tube and I have to agree. It gives glowing, soft skin. It contains 24 Karat Gold Collagenine Boosters and Orange peel extracts that helps in getting a golden glow. It smells wonderful, like freshly cut oranges and has such a gorgeous orange color with golden swirls in it. I use it on washed skin that has been patted dry. It’s best to apply a thick, generous layer since that facilitates easy peeling off. If you apply a thin layer, it will dry fast and then kinda stick to your skin. Then leave it on for 15 mins. It will start to feel dry. Then start peeling downwards from the forehead area. I usually use it once a week. It’s especially great to use right before attending an event since that golden glow is really noticeable..
Price : Rs 105 for a 90 gms tube. ○ Tulsi Turmeric Face wash – This is an anti acne, anti marks formula. Tulsi & turmeric are both known for it’s anti bacterial & antiseptic properties. It comes in a light green bottle with a convenient, flip open lid. The product is also light green in color and has teeny tiny pieces of tulsi suspended in it. It smells of turmeric and tulsi mixed together & thus is a strong scent that I didn’t like at all. Surprisingly, even though it sounds like a product that’s especially made for those with oily skin, it says here at the back of the bottle that it’s suitable for all skin types. I did try it out even though I have normal to dry skin. It didn’t dry out my skin but there was the slightest feeling that it didn’t suit me and thus I immediately applied a skin cream to moisturize my skin. I passed it on to my father who has oily skin and he really loved it. Price : Rs 90 for a bortle containing 100gms. ○ Exfoliating Walnut scrub – I absolutely love this product. In fact, scrubs with walnut shell particles are my favorite because they get the job done and helps in removing dead skin cells, leaving the skin feeling and looking soft. It has a lovely soothing scent. I have been using Everyuth’s walnut scrub for several years now. It used to come in a blue colored tube before. This tube is a new look and advanced formula. It contains Nano Multi vita too, that nourishes and revitalizes the skin. I use this twice a week. Price : Rs 70 for a 50 gm tube. Review : GlamEgo Jan 2018 Beauty Box! Am so excited to review GlamEgo’s very first box of this year!. It’s aptly new year themed and it’s so adorable. The #NoResolutions hashtag made me smile. Other than the picture in the front, every other space on the box is covered with typical resolutions people make such as : Lose weight, Grow hair (which is my personal, one & only resolution this year) & also some not so typical resolutions such as : Talk less, listen to him, do not freak, less instagram etc! Such a fun box at the very first glance. On opening it, there is a card which says “Thanks for making GalmEgo India’s No.1 Beauty box”. Well, no wonder there. At just Rs 299 per month, GlamEgo is definitely worth it. This month’s products which concentrate on the theme of “Lap of luxury” are simply incredible and worth upto Rs 2500!. At the back of the card, they have listed the price and description of the 4 products included in the box. It contains 3 full sized products and 1 deluxe sample. 1) Bio Bloom’s Face oil : This is THE most fabulous thing I’ve ever seen in ANY beauty subscription box ever!. I am a die hard fan of face oils because it takes your skin care regime to the next level. * Contains a potent mix of wonderful oils – Apricot kernel oil, carrot seed oil, rosehip oil, geranium oil, lemon oil, frankincense oil, myrrh, rosemary, vitamin E & evening primrose. That’s it. No other unintelligible & unreadable ingredients!. The Vitamin E in this acts as a natural preservative. * It has a dropper to dispense the product. Is it just me or do you find droppers just so freaking amazing, convenient & expensive looking??.. * It’s suitable for all skin types & for anyone above the age of 18. It has a lovely scent, a potent kind of smell that lingers on the skin and is dominantly of lemon & frankincense. It’s not a heavy, greasy oil. It isn’t that lightweight too. It’s in the middle but gets absorbed into the skin super fast and leaves it looking glowy with a light sheen. Its a beautiful product. I am so in love with it. Because of all it’s ingredients that are expensive in their own right, this premium product is pretty expensive, costing Rs 1499 for a 15ml bottle. The bottle will surely last me a long while since I use it only at night (after serum, before night cream) & only use 6 – 7 drops each time. I’ve used this for some days now and I do feel my skin looks like it’s glowing, in the mornings. It’s age defying results can only be seen after a long term use, however it’s ingredients list makes me believe that this brand knows what they are talking about! 2) Bella Voste Lip Gloss in the color Rust Crush – This is my first time trying this brand and I quite loved it’s quality. It’s packaged well in a long, glass tube. The pigmentation is definitely great and it stays on the lips for several hours, while imparting moisture to the lips. It’s formulated in Italy and is mineral oil & talc free. 3) Natural Bath & Body’s (NBB) Vital Nourishment Cream : This lightweight, white colored cream gets absorbed right into the skin as if it is quenching up the thirst of dry skin!. It smells citrus like and is such a heavenly, luxurious smell. Their tag is “Your lighter-whiter-brighter fix” (though I do not support the ‘whiter’ look claim). It’s ingredients are mainly Vitamin C & Grapefruit, both of which are known to be skin brighteners. This one was a deluxe sample containing just 20 gms. It’s full sized one is valued at Rs 220. 4) Bio Bloom’s Handmade soap : For this 4th product, different people got different things in their boxes. It could have been any skincare /makeup product that’s worth upto Rs 350. I am glad to get this soap. It’s titled Romantic & has rose oil in it which gives a really great scent. It lathers just right and leaves the skin feeling soft. All in all, I am in love with this box and feeling like a spoilt princess ♡. What a great value & a wonderful start to the new year! Check out Glamego’s site to subscribe ☆. Review : Mama Earth Toxin free Baby products! If you aren’t aware of this Indian baby products brand, you should be. 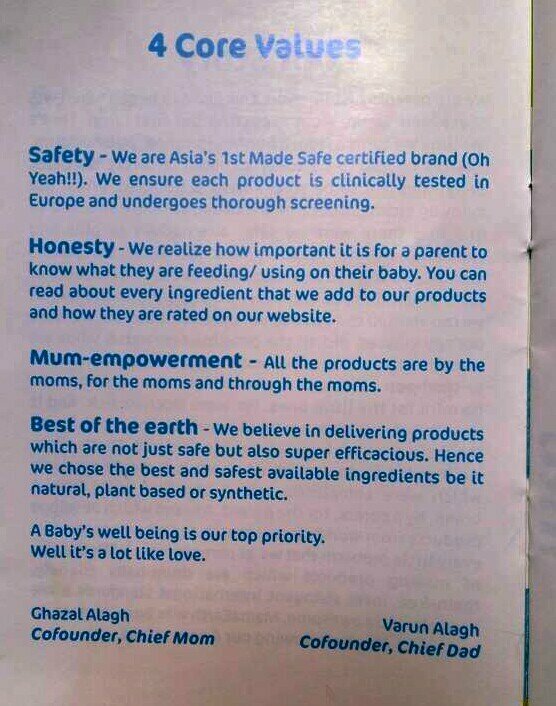 Mama Earth is Asia’s 1st Made Safe Certified Toxin Free Brand. The fact that this brand is founded and created, with a lot of love & thoughtfulness, by a couple who wanted the very best and safe options for not only their own baby but also for other little babies, made me fall in love with it. The ingredients of each and every product are of high quality and free from every NO-NOs out there. You can trust these products to take care of your baby. No doubt about that!. Even though their products target the age out of 0 – 5 year olds, these products can also be used by adults!. ● Moisturizing Daily Lotion : This ultra moisturizing lotion is white in color & runny in consistency. It has a soothing scent as they have used Chamomile essential oil in it. Some of the other ingredients are : Shea butter, Aloevera, Calendula extract, Almond oil, Cocoa butter, Olive oil, Jojoba oil, Vitamin E, Wheatgerm oil etc. It’s really lightweight & absorbs into my son’s skin easily, leaving it smelling lovely while protecting him from dryness. ● Gentle Cleansing Shampoo : This lavender scented, cream colored shampoo foams up on application & leaves my son’s hair soft & nourished. It’s main ingredients are : Coconut based cleansers & conditioners, Lavender essential oil, Vegetable glycerin, Xanthum gum, Aloevera extract & more. It doesn’t irritate the eyes at all. ● Soothing Massage Oil : I have used several massage oils from different brands but this one is just phenomenal. This lightweight, non greasy oil is a natural blend of pure almond, jojoba & olive oils. It contains both lavender & chamomile essential oils and as it’s name suggests, is very soothing to the senses. I love using this after his bath time in the evenings. Other key ingredients are : Cold pressed Sesame oil, Coconut oil & Sweet almond oil. ● Deeply Nourishing Body Wash : This one’s appearance & ingredients are very similar to that of the shampoo. The essential oil included in this product is that of orange & it smells absolutely wonderful. This is a multipurpose product since it can also be used on hair (instead of shampoo). I love products like these. Overall, it’s pure joy to use this brand, both for myself and my son. I love that they have included essential oils for scent rather than synthetic fragrances that are harmful to the soft skin of babies. I highly recommend this brand ♥. It goes without saying, that they are eco friendly and thus the word ‘Earth’ in their brand name. All their products are made in Himachal Pradesh. Also, I wanted to show you guys the lovely & simplistic pouch that the products came in. It’s perfect to stock baby products and to carry in my baby bag. Note:These products were sent to me for review purposes. All opinions are 100% honest & my own. Unboxing : The Day Drinking box April – May 2017 Edition! This is the very first time that I am writing about the Day Drinking subscription box, here on my blog. It’s touted to be the best tea & coffee subscription box in the world!. For each box purchased, the Day Drinking box donates a meal to a kid in India. I love the charity part of it!. A new edition of Day Drinking box is launched every 2 months. In every box, over 60 servings of gourmet tea & coffees from exotic brands of the world, are featured. The April-May edition with 79 servings!. This box is an Indian one but they ship to over 70 countries. It’s priced at $34.90 (Approx AED 128.18 / Rs 2250). 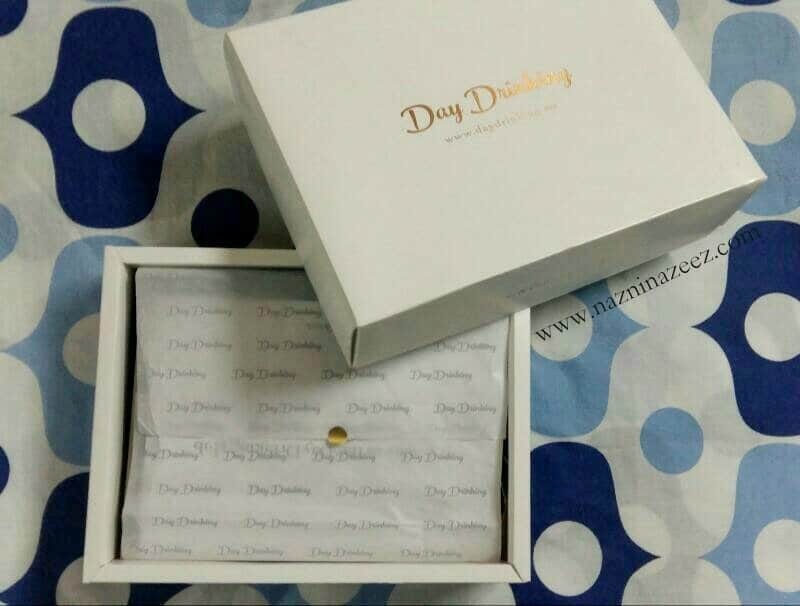 The white box that it comes in has ‘Day Drinking box’ written on it in a golden colored font. On opening, there is a printed sheet of light weight paper sealed with a little golden sticker. With that out of the way, I got a white card which says ‘Welcome to the Day drinking club’ and the hashtag #GetDrunk!. Lol. Other than Teddy Roosevelt, all other brands are completely new to me. Another interesting thing about this box is that, it is made by the same people, who does the Violet Box (the latest edition of which, I had reviewed some days ago). The Day Drinking box is now available on Amazon!. Click here to buy. Note: This box was sent to me for review purposes. All opinions are 100% honest and my own. Miraculous Belly Fat Cutter Detox drink - My results!